During your Main Phase 1: You can Tribute 1 monster; inflict damage to your opponent equal to the Tributed monster’s Level on the field x 200. You can only use this effect of “Dark Strike Fighter” once per turn. Dark Strike Fighter was the first Synchro that really brought the ban list cause for concern. Dark Strike Fighter before its text change was one of those Synchro monsters players knew was going to hit the field before it did, just by how the player would play. If you saw Rescue Cat hit, you knew DSF was eventually making an appearance. Originally, Dark Strike Fighter would come out to help with the FTK/OTK with its 2600ATK, then pop all monsters on your side of the field (including itself) in Main Phase 2, dealing 200 for each star. It worked out to exactly 8000 in the builds that became commonplace in the game. Too easy to summon with generic requirements: Trick, a card to ditch, and E-Teleport, or Cyber Dragon and any Level 2 Tuner. Eventually Dark Strike Fighter was banned and players were able to play Yu-Gi-Oh again. The change forced DSF to activate its effect in Main Phase 1, and only once per turn. That last part was the nail in the coffin for DSF being an incredible monster. 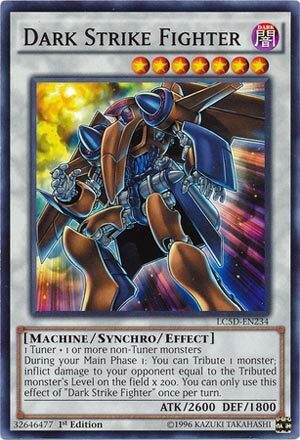 With Pendulum Summoning now in the game, can you imagine if Dark Strike Fighter could rail gun your monsters, even if it was only in Main Phase 1? That would be likely 800 damage per monster, let alone if the opponent had Soul Charge. Dark Strike Fighter deserved its ban and its text change. Still an okay monster, but too slow to be anything close to what it once was. Dark Strike Fighter is a generic Level 7 Dark Machine-type Synchro Monster with 2600 Atk and 1800 Def. Any 1 Tuner and 1 or more non-tuners could summon this in its glory days. At the time, Dark Strike Fighter could Tribute any monsters during either of your main phases and inflict 200 Damage multiples by the level of tributed monster. Now, errata kills cards and Dark Strike Fighter is a victim. Only once per Main Phase 1 can you use the effect on 1 monster. Oh well. It wouldn’t be so bad to have its original text because more monsters don’t have a Level, but that is highly unlikely. The Extra Deck is too crowded and Gaga Cowboy is a more consistent monster damage dealer, or was for a while. I’m glad DSF still looks awesome, at least. Coming in at number 9 on the list is a card that was so powerful upon release due to easy OTKs that it was banned very quickly and didn’t come back until it was erratted in Legendary Collection 5D’s. This might of been higher if it got to have a longer reign of terror. Originally printed in Crimson Crisis, we have Dark Strike Fighter. Dark Strike Fighter is a Level 7 DARK Machine Synchro with 2600 ATK and 1800 DEF that requires a Tuner and one or more non-Tuners. Any non-specific summoning requirements in the Tuner and non-Tuner department is great. The stats are probably the best for a generic Level 7 Synchro there is. DARK is a great attribute, and Machine is a good type. First off, I want to talk about the effect it had before the errata. Back when it was first printed, Dark Strike Fighter could let you tribute any monster at any time during either of your Main Phases to deal damage equal to the Level of the Monster tributed times 200. This was probably used in the Main Phase 2 mostly after you dealt massive damage but left your opponent with a few life points left, Dark Strike Fighter easily finished games off. So easily in fact that as I already mentioned, it was banned. If it still had this effect, it would probably remain banned and be a 4.75/5 card, but Konami decided DSF was worthy of an errata and that is what it got. Now, Dark Strike Fighter can only be used in the Main Phase 1 and is a hard once per turn, other than that, you still tribute a monster to deal damage equal to its level times 200. I honestly think it is worth keeping the monster for the Battle Phase now as that will likely do more damage. For example, tributing Dark Strike Fighter for his own effect would deal 1400 damage and you are sacrificing 2600 ATK that could do major direct attack damage or kill a decently sized monster. Also lets not forget XYZ and Link monsters don’t have levels, so they cannot be tributed. Dark Strike Fighter is not the force it used to be, and that is mostly because of the errata it got. There are still very niche FTKs with it when you deal damage through other means and then this I’m sure, plus if you magically get a monster to Level 40, you can tribute it to deal 8000 damage, but those are niche and not very good plays. Sorry Dark Strike Fighter, you are not what you used to be. Art: 4.25/5 At least he still looks cool. Isn’t it fun how opinions can change of a card (as seen in those reviews) by what it’s discovered you can do with a card? Banned, once upon a time, Restricted, eventually errated and Unlimited. The errata all but killed this card, but was necessary, being able to Tribute a swarm of your Monsters, to include itself, to deal a waterfall of Damage unto your opponent. One Turn Kills were made, baby Jesus cried…it just wasn’t a good time in Yugioh. But we didn’t know this at first, it took a Format to learn and abuse, and then Banned away it went. I know this card isn’t anywhere near as good (yet more fair and balanced) with the errata, but I feel he should be moderately higher on the list. In short, phenomenal at the time, not so much now. Next articleLysandre’s Trump Card – Joins the Pokemon Ban List!